Pictured at the launch of Safenet Supporters are (from left to right) Anthony Duerden, Chief Executive of The Calico Group, Helen Gauder, SafeNet Managing Director. Alex Atkinson, SafeNet Head of Support Services. John Clough, SafeNet Patron. SafeNet Domestic Abuse and Support Services launched the event at Burnley Town Hall on the eve of International Women's Day. The launch of Safenet Supporters included talks from SafeNet patron John Clough MBE of Barrowford and Managing Director, Helen Gauder. Jane’s Place is the first Complex Needs Refuge in the county and was named in memory of Jane Clough, the daughter of John and his wife Penny. It is run by The Calico Group which is made up of several innovative charities and businesses working together to make social profit, rather than financial profit. John and Penny,who are both patrons of SafeNet, have been tirelessly campaigning for legislative changes to increase the safety of anyone experiencing domestic abuse. Both have received the MBE for their efforts. Jane’s Place is the first purpose built specialist 24/7 refuge provision in the North West that supports women and their children fleeing and recovering from domestic abuse. Lots of effort has been channelled into supporting complex needs such as higher level mental health issues, drug and alcohol dependency and offending behaviours. During his speech, John spoke about the importance of looking out for signs of domestic abuse within relationships and urged people to seek help when needed. This was followed by a powerful performance about domestic abuse from drama-based training company AFTA Thought to give supporters an insight to the challenges that people who are supported by SafeNet can often face. 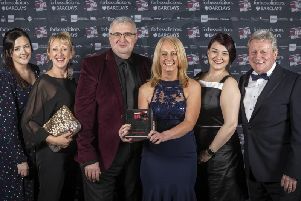 Helen Gauder, SafeNet Managing Director said: “At SafeNet, we are often approached by people who want to give something back, to donate their free time and play a bigger part within the Lancashire and Greater Manchester communities.